In order for Yahoo! to develop a new marketing scheme to push its thriving products, they sought the help of tronic studio to help them produce a new interactive experience. When I first came across this video it made me think of processing – how the user has the ability to manipulate the program – but unlike processing you do not have to edit the script via a computer instead it is gestural-based, adapting as the current user makes body movements. It makes me start to think of the possibilities of our final project and how it will be interactive. Another interesting facade that consists of a grid of reflective surfaces that shift from pointing down to render a dark pixel and up to reflect a light pixel. By changing rapidly between these two states the facade can make motion patterns. Interesting adaptive facade system by Giselbrecht + Partners. Uses mechanized rollers and folding facade panels to create solid and void spaces that change throughout the day. 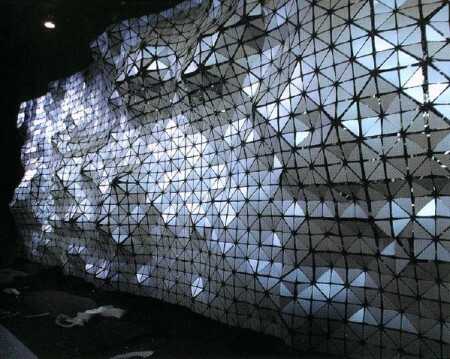 The Hyposurface is a free forming wall/skin that takes any number of inputs from internet to sound and touch and transforms its shape and frequency to do an unlimited number of effects. Use for text display, interactivity in touch and human movement, color washing, seating, and much much more.